Bharatiya Vidya Bhavan's Public School Vidyashram, Jubilee Hills, Hyderabad donates books, toothpastes to Kasturba Gandhi BalGurukul, Indian Development Foundation (IDF) appreciates the efforts & initiatives from the students of the school. IDF thanks Sr.Principal, Mrs.Rama Devi, for her kind contribution towards for the students of BalGurukul. You support we do the rest !!! VIBGYOR spreading colors in St. Catherine School. As a part of the prog. students from the School put up various activity like songs, dance, played dumb charades and even Puppetry show. 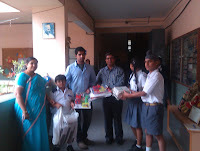 The entire event was very well managed by the teaching and non teaching staff of the school. The schools also distributed various requisite viz; washing powder, Iron for clothes to the school, eatables for the students, etc. 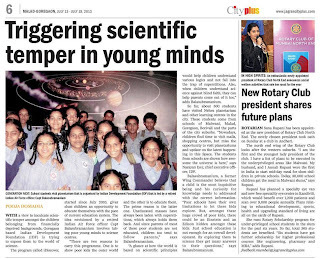 We thanks, all the VIBGYOR students and staff; Ms. Shrishti Ruia, Ms. Harpriet, Ms. Arpita, Ms. Shraddha, Ms. Nikhat, Ms. Shoma, Ms. Padmaja & Principal Shim Mathew. Special thanks to the Supporting staff of the School in assisting the Prog. Also the sister of the St. Catherine school, Sis. Loretta, Sis. Juliet, and Sis. Vinita. 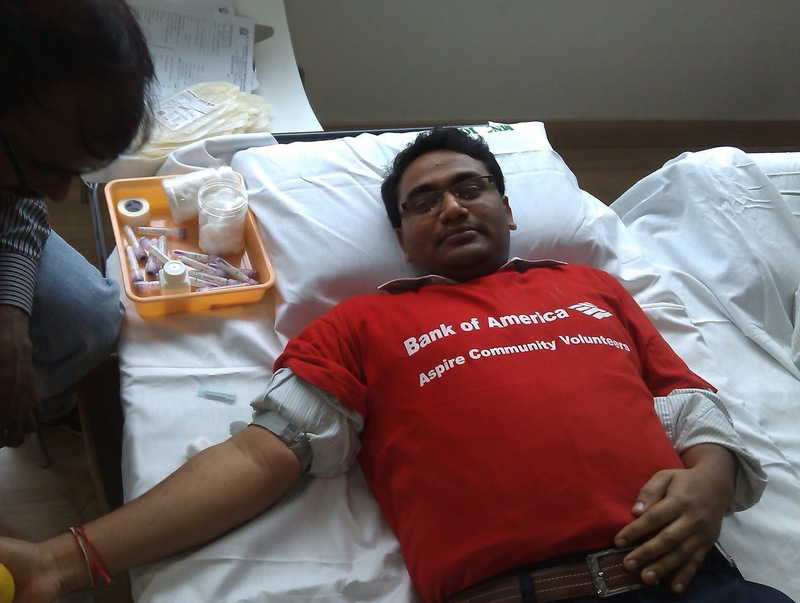 Indian Development Foundation appreciates the efforts of the employees of Bank Of America who came forward on 25th Jul 2013 to donate blood to the poor and needy in government hospitals. 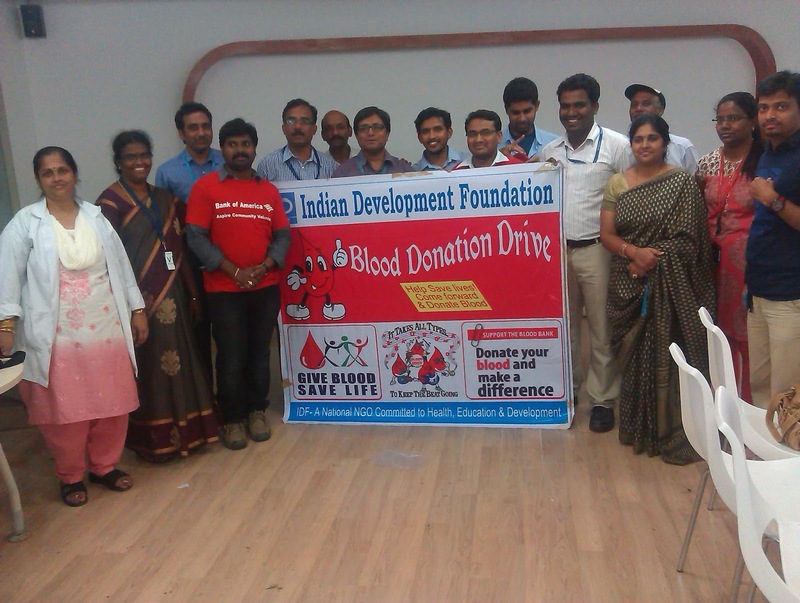 IDF & BOA with the assistance of MNJ Cancer hospital, Hyderabad collected 234 units blood. The Hospital authorities were very thankful as this was one of the highest collection of blood units from blood donation drive. Employees were very happy to donate blood to poor patients in government hospitals. The great sympathy and generosity shown by Bank of America sends an inspirational message to others regarding the importance of blood donation to government hospitals. The donation of blood was very precious to these patients and will gave a new life to needy. 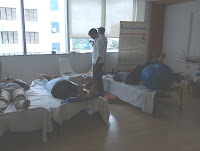 We would like to specially thank Mr.Krishna Manohar, Mr.Viswanadh, Mr.Vikram, Mr.Suvendu, Mr.Srinivas and Mr.Chakradhar for their active involvement in helping to conduct the camp as well motivate the employees to come forward for blood donation. We would also like to thank all the volunteers who supported us in the camp. Indian Development Foundation distributed Dresses, shoes, crayons, pencils, to the children of Shanthi balkurukul, Ashok Nagar, Bangalore on 23rd July. 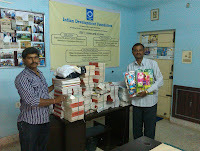 The goods were donated to IDF from Standard Chartered Bank, koramangala Branch ,Bangalore. Mr. Jaydeep from Cash Management Services division helped IDF in the procurement of the goods. The children happily received the gifts and the sister of the school appreciated the efforts of the Standard Chartered Bank and IDF. 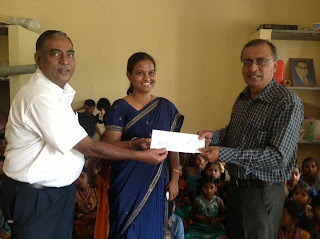 Mrs. Kannika Iyer from standard charted bank, Bangalore was present for the donation . Indian Development Foundation Conducts Health awareness prog. in Bangalore. IDF guided the students of Holy saint school, ICSE division, Jayanagar., Kamala Nehru Makkala mandhira boy's school & Kamala Nehru makkala mandhira girl's school Basavangudi. Indian Development Foundation and Podar International School, Mumbai conducted a tree plantation activity with the students of IBDP 1 & IBDP 2. The students planted saplings in the premise of St. Catherine School, Andheri. Students were happy to plant saplings as this was something which do rarely. The tree plantation activity was conducted as a part CAS- Creativity, Action & Service prog. of the school. IDF appreciates the efforts of the school in imbibing the values for Social service and community development in the students. 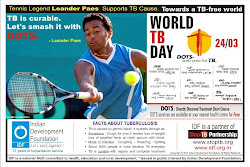 Indian Development Foundation (IDF) conducted Health Awareness Program (HAP) & TB awareness at EAST WEST School, Arumugam circle, Basavangudi, Bangalore. The Programme was conducted by Dr.S.Franklin & Mr.Arulraj. 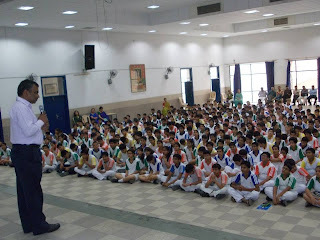 Approximately 200 students attended the Audio-Visual (AV) programme. The session was very interactive as many students asked several queries and doubts about the prog. and also presented their view about the same. Principal supported well by guiding students about the seriousness of the awareness programme and asked students to disseminate the awareness. she also proposed to participate with IDF in the social activities during school holidays. IDF appreciates the continued support of EAST WEST School. 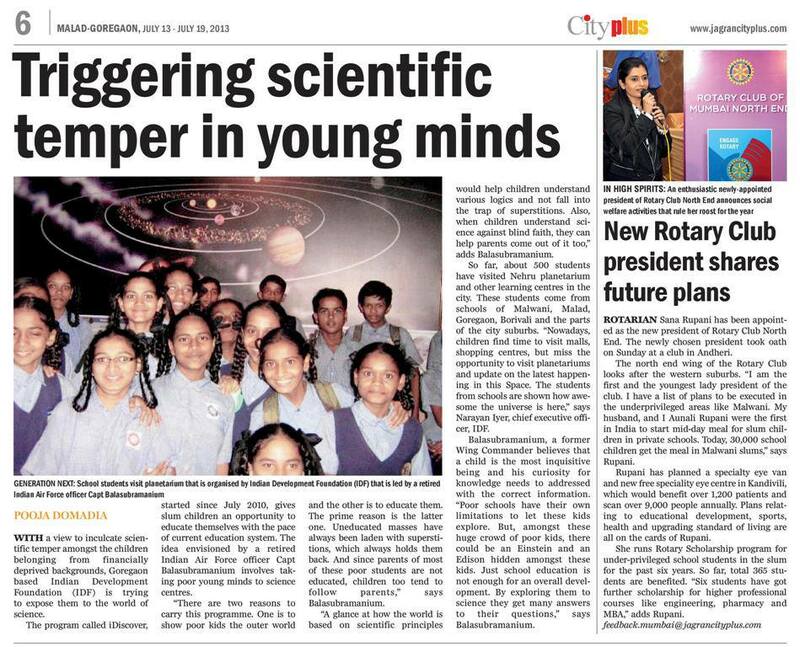 Dr. Narayan Iyer addressed the students of Tagore Public School, Shastri Nagar, Jaipur on 15th of July 2013. Shri P. D. Singh, Chairman of Tagore Group of Institutions appreciated the work of IDF. Tagore Public Schoolteams have been rendering relentless support to IDF for over two decades. IDF salutes TPS schoolteam. You support we do the rest!!! Mrs. Krishnaveni, Headmistress of Corporation School, Mogappair has inaugurated the Kalam Bal Gurukul today. Kalam Bal Gurukul is functioning in IDF office premises for the benefit of the underprivileged children. Mr. S. Sreeram during the inauguration said, " the Kalam Bal Gurukul is opened for the benefits of the underprivileged children in an around Mogappair. He requested the children to utilize the opportunity and study well. Mrs. Krishnaveni, Headmistress of the corporation school, Mogappair appreciated the initiative taken by the Foundation and requested the parents to support the activities of Foundation in all possibile way. Mr. Sathayamurthy and Mr. Navaneeth appreciated the students for enrolling themselves and wished them all success. Two reports in City Plus Jagran Newspaper - 13-07-2013. 2) Rotarian Sana Rupani taking over as the new President of Rotary Club of Mumbai North End. Our special thanks to City Plus Jagran Team for supporting social projects. IDF visits Educational Hub Losal, Rajasthan. 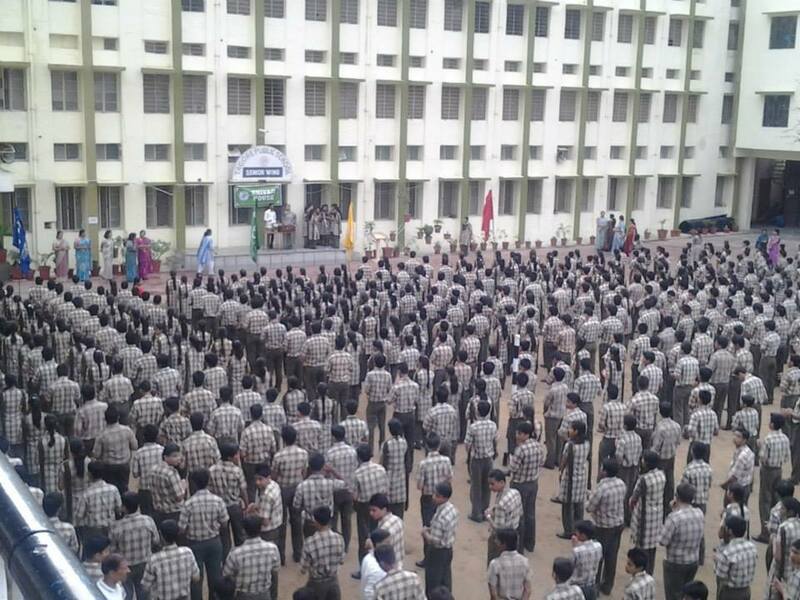 It was a matter of pride and honour for Team Indian Development Foundation (IDF) to visit the educational place called Losal in Sikar (Rajasthan) and address a gathering of 3000 students on 13th July. The Chairman of the School Mr. B. L. Ranwa extended courteous & fullest support to IDF's social projects. Principal Mr. B. L. Bajia exhorted the students to take part in social projects. IDF received wonderful support from Losal. IDF congratulates school on completing 24 years of academic excellence, the school is known for discipline, punctuality and performance. Losal is holy land of Baba Parmanand and Baba Raghuver Das ji, both famous saints of Shekhawati. This educational town is situated in high hills of Arawali. 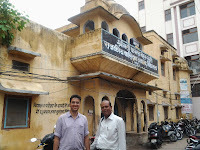 The oldest school here is senior secondary co-ed school, built by the late Seth Shri Dedraj Khaitan. Now there are about 50 schools and colleges in Losal. Total resident population of Losal is about 30,000 in addition to more than 15,000 students studying in local institutions. Losal is holy land of Baba Parmanand and Baba Raghuver Das ji, both famous saints of Shekhawati. This educational town is situated in high hills of Arawali. 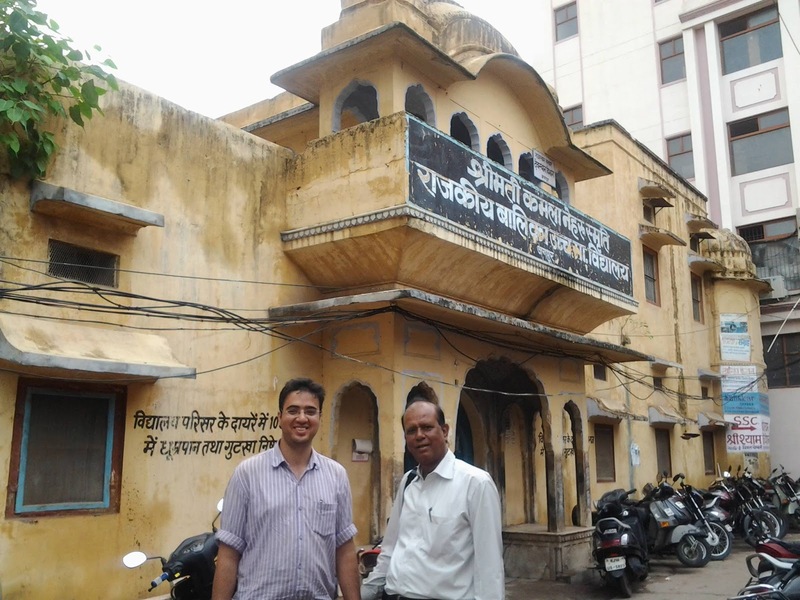 The oldest school here is senior secondary co-ed school, built by the late Seth Shri Dedraj Khaitan. Now there are about 50 schools and colleges in Losal. Total resident population of Losal is about 30,000 in addition to more than 15,000 students studying in local institutions. Shekhawati Educational Group is also one of the most popular school in private sector directed by Mr. B. L. Ranwa and managed by Mr. Bajrang Lal Bajia. Chena Ram Bajia from Haripura also studied in Shekhawati Losal. Our special thanks to Mr.Ajit Singh Chouhan, IDF Social Ambassador who co-ordinated the entire programme. Mr.Simon Peter and Mr. Kovid Oli from IDF also joined me for the morning assembly. Inducted the Cabinet of Ministers and gave them portfolios and responsibilities. Class Monitors were also inducted during the day. The event began with tree plantation. Addressed the students on `Tolerance and Social Values'. 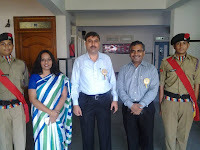 Mrs. Sarita Katiyar, Principal, RIS appreciated the work of IDF and also congratulated all the students. IDF Presented educational assistance for several girls in Govt. 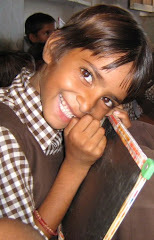 Girls Schools in Jaipur. 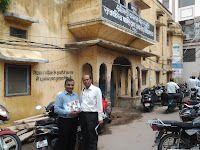 Rajkiya Balika Senior Secondary School, Jhotwara, Jaipur and Rajkiya Balika Secondary School Kamala Nehru, Johri Bazar, Jaipur. The students in Govt. Girls Schools also participated in social projects of IDF. We salute their social participation. Indian Development Foundation Launches Prarambh Bal Gurukul 2 at Batta Basti, Shastri Nagar, Jaipur on 11th July 2013. It is a great moment of satisfaction to see children getting into the stream of education. 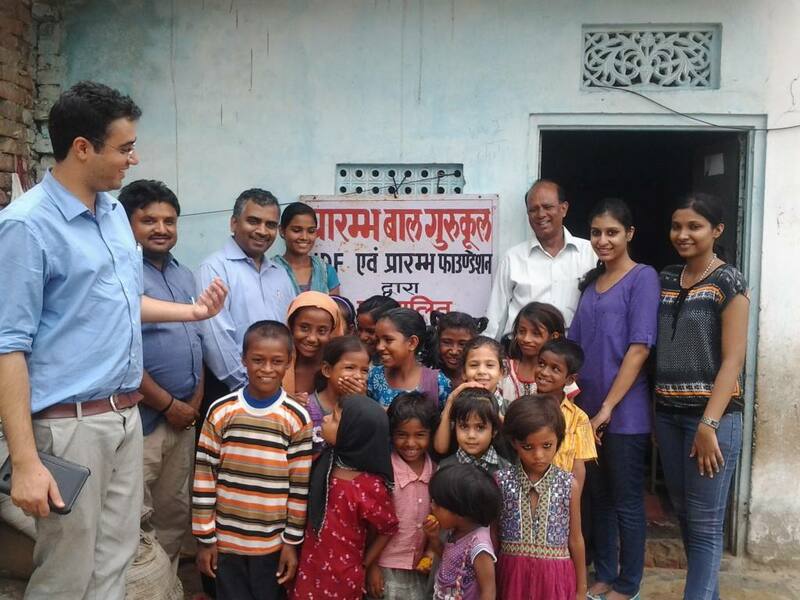 IDF in collaboration with Prarambh Foundation is operating 2 Bal Gurukuls and a women empowerment project in Jaipur. IDF CEO Dr. Narayan Iyer, Mr. Kovid Oli, Mr. Simon Peter and other IDF Social Ambassadors were present to bless the students. Indian Development Foundation organized a talk on student social responsibility and health awareness at Sanskar School, Jaipur. 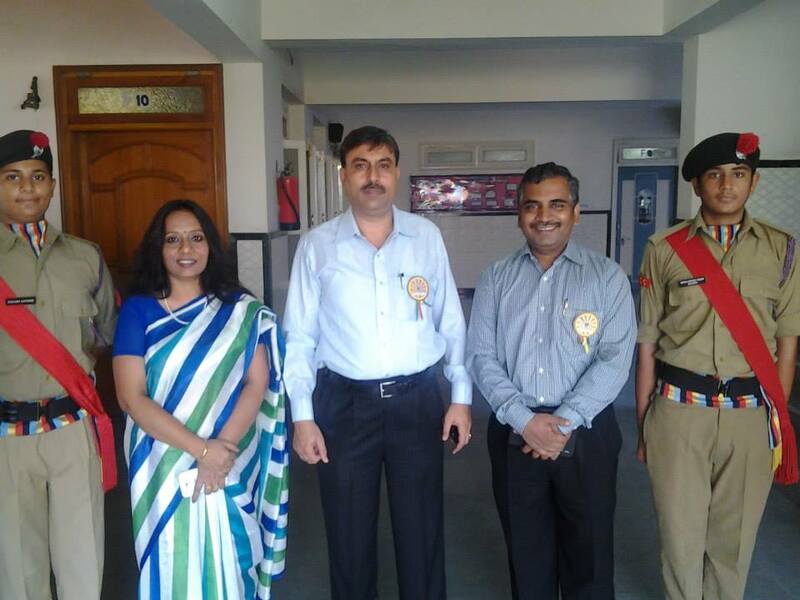 Principal Mrs. Rama Datt and Vice Principal Ms. Giridhar Kumari appreciated the work of IDF and exhorted students to participate in various social projects. 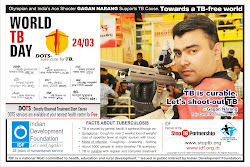 IDF social ambassador Sahil co-ordinated the social campaign. Indian Development Foundation conducted blood donation camp in St.Francis College, Begumpet, Hyderabad. St.Francis college is one the top most and prestigious college for women in Hyderabad. This college is managed by Sisters of Charity. 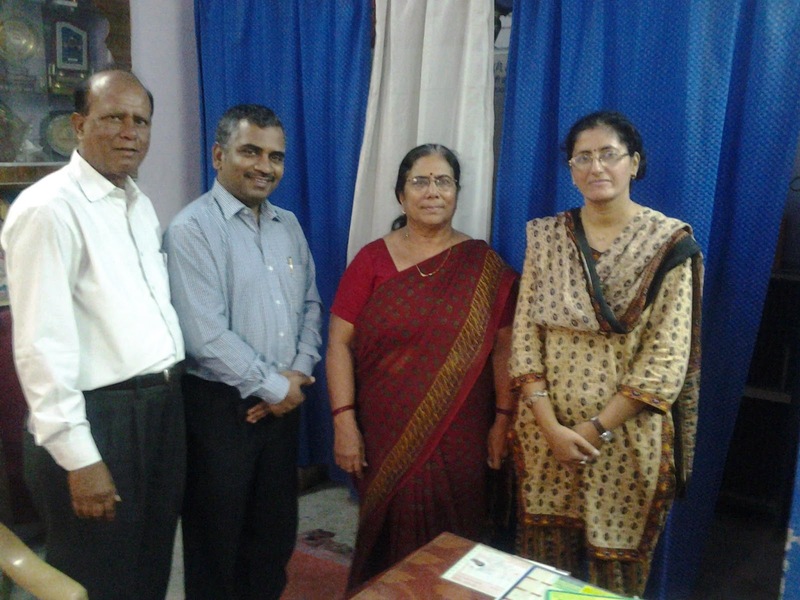 Sr.Celine from Missionaries Sisters of Immaculate, Hyderabad were present as a guest. The camp was organized for Osmania Blood bank to help poor patients in Osmania Hospital, Hyderabad. NSS officers Mrs.Shobhana and Dr.Jyothi from St.Francis college coordinated with IDF and assisted in organizing the camp. A team of blood bank officer Dr.Swarajya Kumari , Assistant doctors, Para medics, Technicians, support staff from Osmania Hospital blood bank supported the entire activity. IDF social Ambassadors Dr. Nikhil, Dr.Sravan, Mr.Madhukar & Mrs.Rama also helped in coordinating the camp. With support from all the samaritans IDF was able to mobilise more than 130 units of blood. Mr. Sanjay Ram, (Project Coordinator, IDF) Introduced the institution to everyone present and highlighted the projects and events/activities viz; health projects, Vimala Centre (Mumbai), sarva sakhi swabhimaan (S3), blood donation camps Vegavaram and other Bal Gurukuls et al to all the dignitairies, students, staff and everyone present. The principal , NSS members, Students from St.Francis , Lions Club members and Osmania Hospital's blood bank team thanked IDF and appreciated IDF team ( staff and Social ambassadors) for their work and activities and also for initiating this wonderful noble cause of coordinating blood donation camps to government hospitals which will certainly help poor patients in need. IDF team comprised of Mr.Ramesh, Mr.Balakrishna, Mr.Mustafa, and our social ambassadors Dr.Nikhil, Dr.Sravan , Mr.Madhukar, Mrs.Rama and Mr. Sanjay Ram coordinated excellently the camp. A special appreciation to Principal Sr.Alphonsa , NSS officers Mrs.Shobhana and Dr.Jyothi and all NSS volunteers of St.Francis for all the arrangements and support was very happy to be a part of this noble cause. Heartfelt thanks to Sr.Celine for being a part of the camp & members Lions club of Hyderabad West who participated in the camp by sponsoring snacks and food to all volunteers. IDF Sensitizes students for the Social Development Prog. 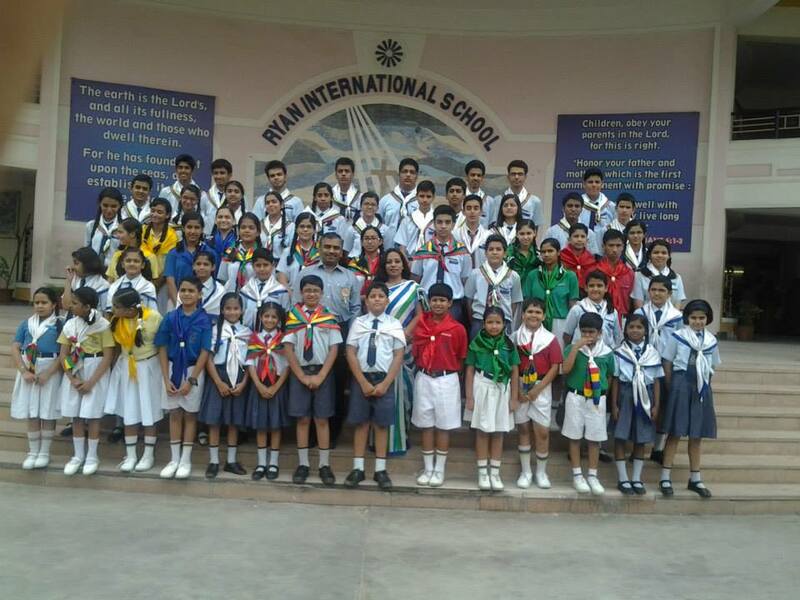 Indian Development Foundation Conducted Social Sensitization Prog., For Podar School, IB Students, Mumbai. IDF Social Ambassador Prof. Prajesh Trotsky guided students on the importance of the social inclination among students for a comprehensive development. He also guided students on the role they can play for the betterment of the society. IDF Development Executive Mr. Nasrulla Adamji highlighted on the Projects of the organization and explained how IDF and Podar can collaborate for the school's students social prog., Creative-Action- Service. Mrs. Hema Rajan, Co-ordinator, Podar IB was present and she adviced students to take up social projects with IDF to sensitize with the needs and wants of the society. Special thanks to Principal Mrs. Vandana Lulla for her efforts to collaborate the students with IDF for the Social programmes. 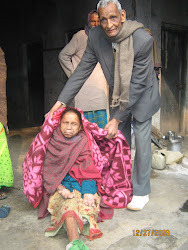 Indian Development Foundation conducted Health Awareness Prog. (HAP) in various schools. Some of them are Vellankanni matric school , Yogi vemena matric school Hosur- Bagalur Road, St. Fathima's Hr.sec.school, Asian Christian Academy, Don Bosco Hr. Sec School, Ashok Leyland School, TVS Academy and many more. The school authorities & Management were supportive to the efforts and appreciated IDF's activities and encouraged the students to spread the awareness as much as possible.The Schools also asked the students to donate for the good cause. 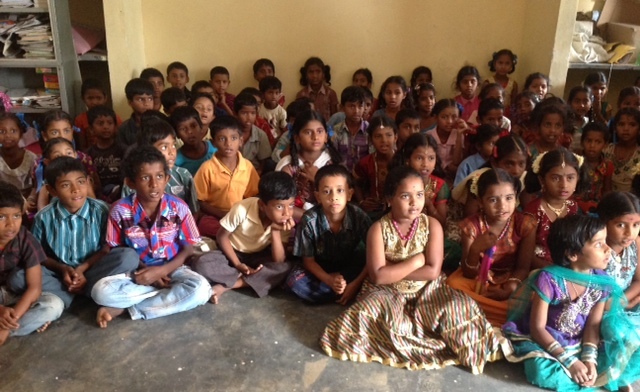 Indian Development Foundation launches TORVI Bal Gurukul at Chithradurga, Karnataka. TORVI Bal gurukul is dedicated for the welfare of the students from Chitradurga district. The children were very happy with the induction of Bal Gurukul for assisting them in their education. IDF educates - enlightens - empowers the young minds. Ramakrishna Bal Gurukul was inaugurated today at Govt. Primary School, Subash Nagar, Bellary Nagar, Bangalore for the empowerment of children from the families of poor quarry workers. This is the second Bal Gurukul started by IDF in collaboration with Good Neighbours India, an NGO, dedicated for the welfare of urban migrant workers. Govt. 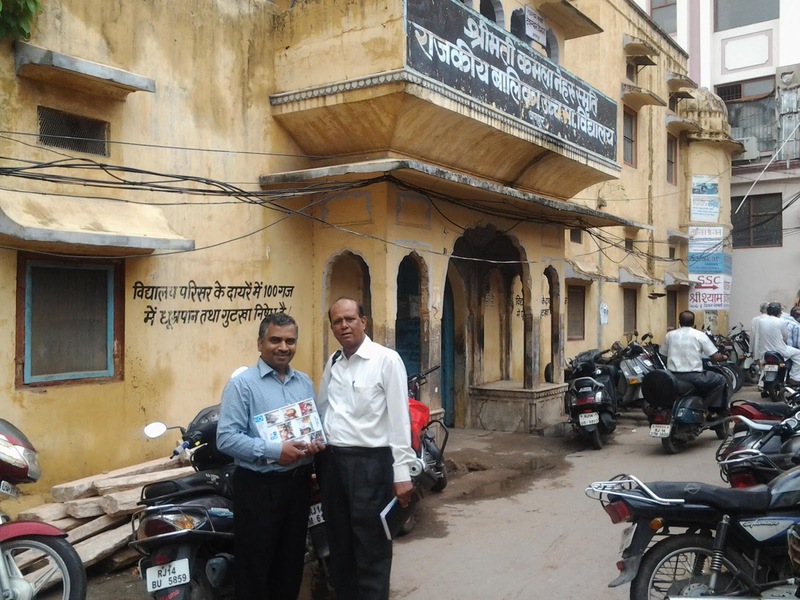 Primary school, Subash Nagar has 100 children and the school has only one teacher and a Headmaster. As the HM has to attend to admin works as well, the onus of teaching the children was solely of the single teacher. Ramakrishna Bal Gurukul teacher, Ms. Vinutha, will work full day, helping the school in the day time and taking special care of 50 deserving poor children in the evening. The Headmaster, Mr. Lingappa was greatly encouraged by the Bal Gurukul Program and he felt confident to impart good education to the children. The Bal Gurukul was inaugurated by Mr. Muniraju, Executive Director, Good Neighbours India. Mr. Arumugam, President, School Development Management Committee, felicitated. Dr. S. Franklin, prompted the children to study very well and emerge successful in their lives. Ms. Meena Arun, Project Manager, Good Neighbours India & Mr. Ramakrishnan, Zonal Officer, IDF, made necessary arrangements for starting the Bal Gurukul. Mr. Arulraj, Development Executive, IDF and Ms. Anita, Committee Coordinator, Good Neighbours India talked the occasion. The children came out with colourful cultural programs and won the appreciation of all. Ramakrishna Bal Gurukul will be quite successful in empowering the children towards a brilliant future. Greetings and good wishes from Dr. ARK Pillai. Dr. ARK Pillai, founder President, Indian Development Foundation visited Vimala Dermatological Centre on 3rd of July 2013 and celebrated his birthday with the children and inmates of the Centre. Dr. Pillai and team IDF distributed food to all the children and the inmates of the Centre and greeted them. Rev. Sr.Hubert and the entire Vimala Centre Team congratulated Dr. Pillai for all the support and prayed for his goodness mission. The inmates of Vimala Centre felt extremely happy to meet Dr. Pillai and they all greeted him with a smile. IDF gifts 10 new Bal Gurukuls to the nation on Dr. Pillai's birthday. Dr. Pillai rededicates his life for social causes as he enters 86 today. In his message, the `social soldier' and octogenarian Dr. Pillai conveyed good wishes to all the children in over 125 Bal Gurukuls spread across India. Dr. Pillai visited the leprosy centre in Mumbai, distributed food to the inmates and spent time with the Vimala children. IDF will strengthen its efforts in health, education and women empowerment projects in India and with the help of Samaritans, networking agencies and schoolteams, IDF will try its best to reach out the needy people, he added. IDF launches Sri Ramakrishna Bal Gurukul in N.S. Iyah Mem. HR. Sec. School. Indian Development Foundation launches Bal gurukul in Sri Ramakrishna Bal Gurukul N.S. Iyah Mem. HR. Sec. School, Nilgiris. Sri Ramakrishna Bal Gurukul was inaugurated by the Headmaster Mr. B. Mani of N.S. Iyah Mem. Hr. Sec. School. Mr. D. Mano Ranjit Lad, D.E. IDF told about the importance of the Bal Gurukul and how it should be organized in a wonderful manner. Speaking on this occasion, he said that the students should not miss this opportunity, he asked them to utilize it in a proper manner. Since this is a God given opportunity he also asked them to thank God. He promised that the staff and the students assure 100% guarantee to utilize this opportunity. 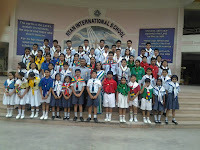 All the students of the school participated in the inaugural function.